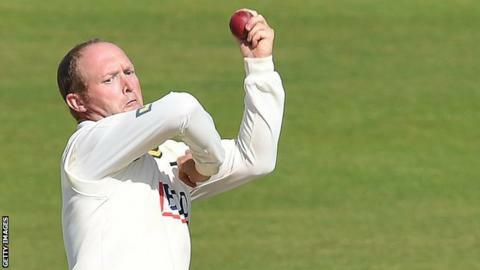 Nottinghamshire's ex-Lancashire spinner Gary Keedy has announced his retirement after a 23-year professional career. The 40-year-old, who has taken 696 first-class wickets, will continue working with Notts as a spin bowling coach and assistant physiotherapist. Keedy played 215 of his 227 first-class games during 18 years at Lancashire and helped them win 10 trophies. "I've got a nine-year-old daughter who I'm missing growing up and it's time to put the 23 years to bed," Keedy said. Keedy only played one game this season, taking match figures of 5-107 as Notts beat Sussex by an innings and 103 runs. Keedy said talented teenager Matthew Carter had influenced his decision to quit. "I don't want everybody to get carried away, but I'm really excited about Matthew," Keedy added. "He's got all the makings of a very good spin bowler. "With the development of Matt - and a few other spinners coming through - now is the right time for me. "As a 40-year-old that's only realistically going to play the odd game, it's right for me to call time and concentrate on other things. "I've got my spin bowling coaching which has been very successful so far that I'd like to concentrate on, and I've got my physio skills that I'll use somewhere along the way." Keedy began his career with Yorkshire before joining Lancashire in 1995. After 18 years with the red rose county, he signed for Surrey for the 2013 season and moved to Notts last summer.